When I attended IDF 2014 in San Francisco, one of the most prominently hyped products was the then-forthcoming BioSport™ earbud set with integrated heart rate monitor. 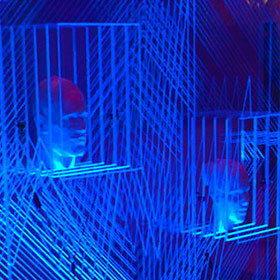 There was an impressively large and aesthetically awesome area of the Moscone Center dedicated to it. The headphones, produced by SMS Audio, were featured in the keynote and even Google co-founder Sergey Brin made a random appearance to participate in some yoga as part of its promotion. For attendees, the coolest part came during the keynote when it was announced we'd all be getting these $150 headphones for free. Months passed with no word, but right before the Christmas holiday a mysterious package appeared on my doorstep. 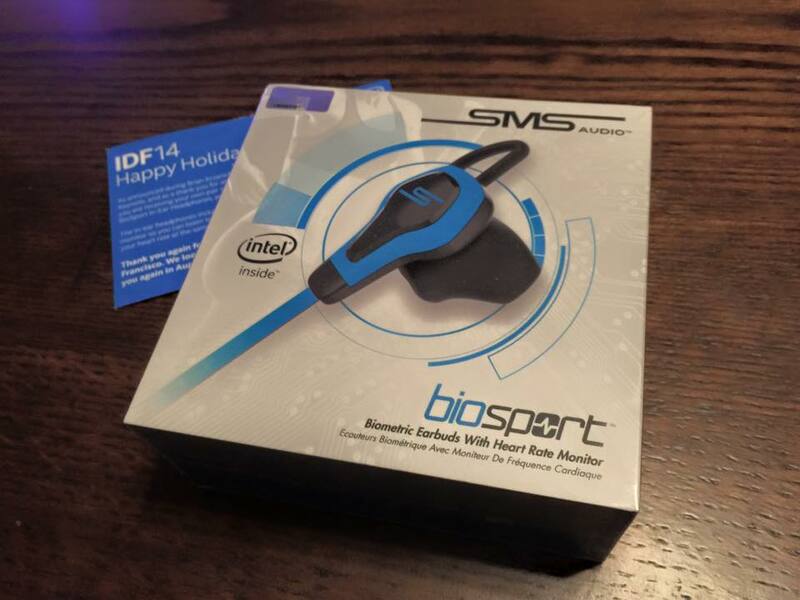 Inside contained the message: "As announced during Brian Krzanich's opening Keynote, and as a thank you for attending IDF14, you are receiving your own pair of SMS Audio BioSport In-Ear Headphones, powered by Intel. The in-ear headphones include a heart rate monitor so you can listen to music and monitor your heart rate at the same time." Without question, BioSport's most distinct selling point is that it can conveniently monitor your heart rate with no added hardware or power source needed apart from the standard 3.5mm headphone jack, while offering high quality audio listening at the same time. The official marketing line by SMS Audio reads: "Get your heart racing and measure every beat. The BioSport™ – powered by Intel – combines Studio Mastered Sound with accurate biometric monitoring creating the ideal training partner." This product contrasts with the vast majority of health-related monitors that utilize Bluetooth and other technologies. The heart rate is monitored via an optical sensor on the bottom of one of the earbuds that fits snug into the inner ear. This is not the first headphone-based heart monitor on the market, but is the first and only one that I know of to not contain any batteries and to not require charging or Bluetooth connectivity. The BioSport headphone set was first made available to the public in December 2014 for $150. Although I received mine at that point nearly six months ago, I did not give it a proper run-through until today. I decided to test the headphones out in lieu of my Bose in-ear headphones while biking across a 10 mile off-road trail. I am not exactly an audiophile and was unable to find any publicly disclosed technical specifications of the integrated BioSport headphone speakers. Intel's website describes the audio quality simply as "professionally tuned 12 mm drivers deliver crisp vocals, tight bass and dynamic mid-tone for studio mastered sound to help drive your workout even further." I found the audio quality to be quite exceptional; the headphones were able to pull out a fair amount of bass and treble from all the music I listened to during the ride and vocals were clear and crisp. The set is definitely leaps and bounds better than any default or discounted in-ear headphone set, yet my Bose SoundSport still takes the win for overall sound fidelity, at least in my ears. I should mention, however, that intermittently the audio would pop and only appear through one of the two headphones as if a short in the wire. The general build quality of the headphones seems solid and resistant to wear, as is to be expected by an exercise-oriented set like this (including IPX4 rated water resistance). The wires are flat and lightweight and I had no discomfort in the hour or so that I had them on while riding bike. There is no real cable management aside from a clip that the wires can be fed through and clipped to a piece of clothing, but I did not have any trouble with tangles or snags when wearing them without the clip. I ran the cables from my head to a front pant pocket that housed my egregiously large iPhone 6+, with the wires running beneath my t-shirt. Three different sized buds are included so people with different sized ears can hopefully find a more accommodating fit–although there is no getting around the size of the sensor itself so those with smaller ear openings may find discomfort or difficulty getting the sensor to receive accurate readings. 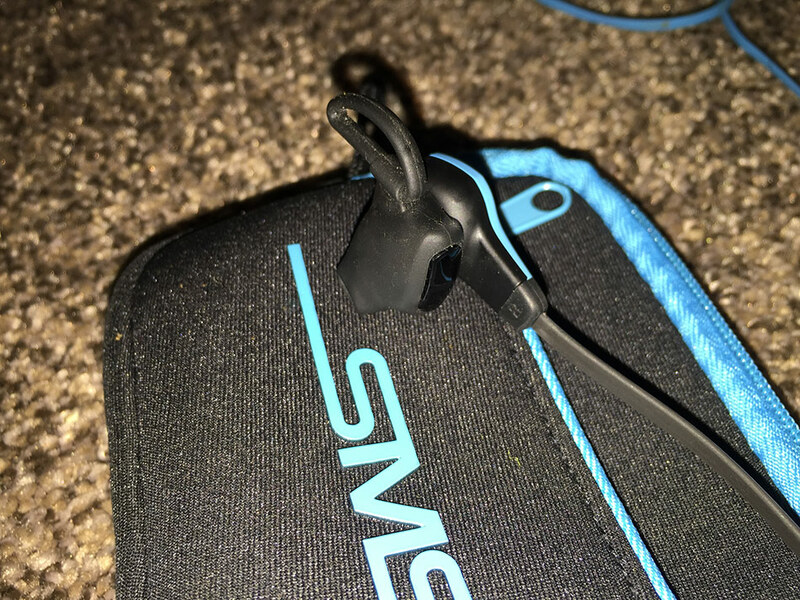 Since the BioSport headphones deviate from wearable norms by using the analog headphone jack for power instead of Bluetooth, support for it is substantially less than competing products. Although Intel's website and some packaging specifies that the BioSport is "compatible with major fitness apps," as of this writing it is still only supported by the RunKeeper app. This severe app restriction was a major turn-off for me from the beginning; I had hoped that after leaving it dormant for six months it would have much broader app compatibility by now. Not so. The BioSport FAQs have stated for just as long that "right now, Runkeeper is the only supported app. More will be announced soon, so stay tuned!" Device support is also limited, with listed support of only a half dozen Android devices and the iPhone 4S+. When biking I prefer Cyclemeter but could not use it with this product. As its flagship feature, the heart rate monitor felt adequate–but only when it was actually working. As mentioned, the pairing process requires a compatible device and the RunKeeper app exclusively. Once installed and on compatible hardware, a simple toggle option in the Devices screen will enable the analog heart rate monitor. 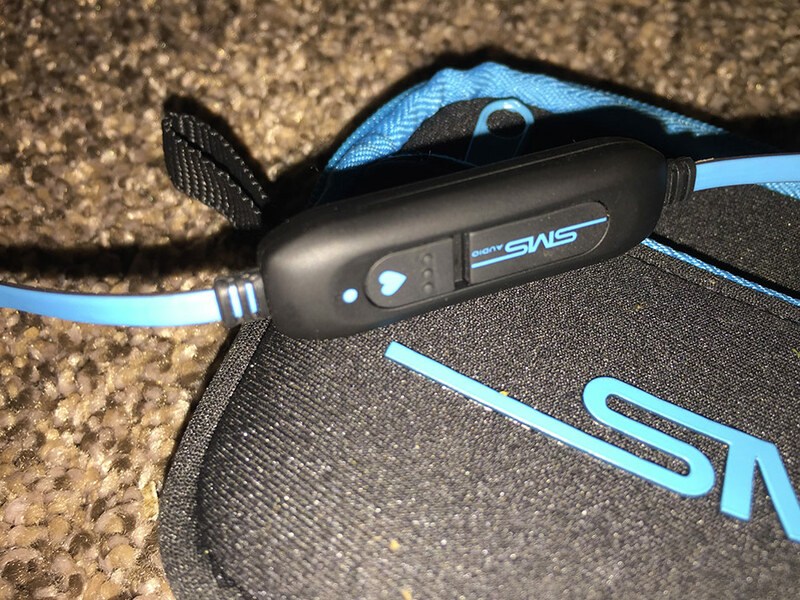 The headphones themselves have a toggle to alternate between heart rate monitor and microphone. If taking a call, you must switch to microphone mode, thus disrupting the heart rate monitoring. In essence, taking a phone call while working out will result in a flat-line for that period of time in your heart rate log. During my testing, I found the sensor to be very sensitive and any slightly off placement within the ear led to no recorded heart rate even when it felt appropriately placed. After running my course, I reviewed the heart rate chart in RunKeeper only to discover nearly half the trip was lacking any heart rate data. I did not remove nor manually alter the headphone placement for the duration of the trip, but about midway through the sensor kicked in and continued accurately for the remainder of the ride. Perhaps this was a fluke and not a common occurrence, I will evaluate more in the future. 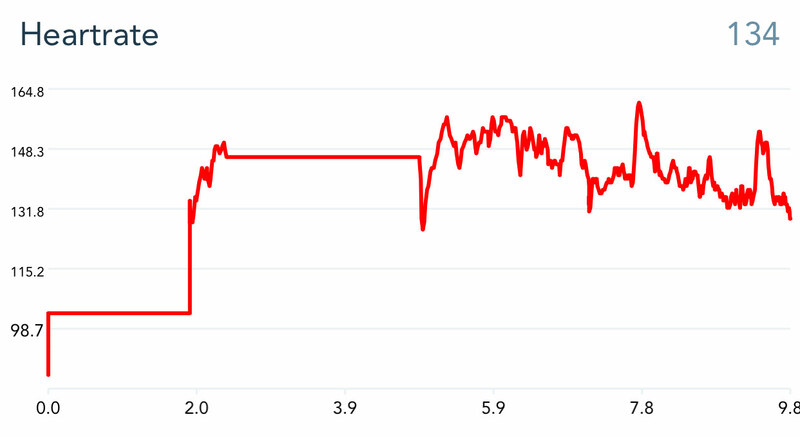 At two different points during my routine, totaling nearly half of the ride, my heart rate had flatlined. One convenience I have come to take for granted over the years is that of volume control via headphones. This became a natural feature found on most pairs of mobile headphones I encountered, from Apple's prebundled headphones to my higher-end Bose set. The BioSport headphones includes more limited headphone-accessible options. You can toggle between heart rate mode or microphone mode, and through a series of button presses can control your music playback. Sadly no volume control was added to these headphones, so you are forced to manually adjust the volume on the phone itself whenever it needs changing. This was a tremendous omission in my view especially given the cost of the device. The ability to monitor your heart rate while listening to high quality music without having to wear additional devices or charge anything is an appealing prospect. Yet, as I see it the existing drawbacks and implications of the BioSport tech outweigh the benefits. For $150 you get a pair of headphones that, at best, are comparable to the audio fidelity of more affordable alternatives and a heart rate monitor that to this day only works with a single health app. The BioSport headphones are not wireless, which some may find inconvenient, and feature no volume control so you must whip out your phone in the middle of a workout to alter the volume. Taking calls will also disrupt the heart rate monitor and lead to incomplete log data. For the same cost or less, a person can buy a dedicated Bluetooth heart monitor and a pair of quality wireless or wired headphones with integrated volume control. I feel that wearing an extra band and having to occasionally charge a dedicated heart monitor is not as inconvenient as some of the struggles endured with the BioSport solution.